PRODUCT DESCRIPTION: Fast working low odor residual aerosol which uses Esfenvalerate for an active. It comes with a handy crack and crevice injecting tube that allows the applicator to get product applied deep into voids and spaces where pests like to hide. * Long lasting residual – up to 4+ weeks! 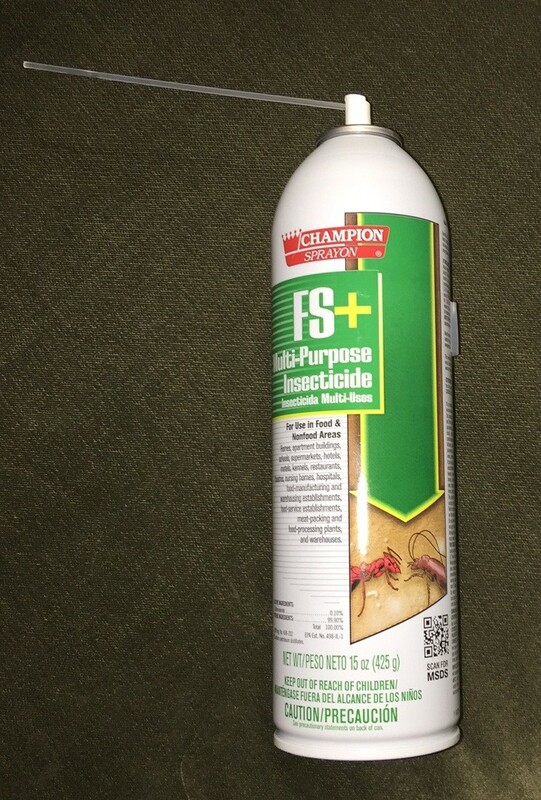 Kills: Ants, Bees, Bedbugs, Black Carpet Beetles, Booklice, Boxelder Bugs, Brown Recluse, Carpenter Ants, Carpenter Bees, Carpet Beetles, Centipedes, Chocolate Moth, Cigarette Beetles, Clover Mites, Cluster Flies, Cockroaches, Crickets, Dermestids, Dog Ticks, Drugstore Beetles, Earwigs, Elmleaf Beetles, Firebrats, Fleas, Flour Beetles, Grain Beetles, Ground Beetles, Gnats, Hornets, Houseflies, Midges, Lesser Grain Borers, Lone Star Ticks, Maggots, Meal Moths, Mole Crickets, Mosquitoes, Moths, Mud Daubers, Pantry Pests, Palmetto Bugs, Pillbugs, Rice Weevils, Silverfish, Small Flying Moths, Sowbugs, Spider Beetles, Spiders, Springtails, Stinkbugs, Termites, Ticks, Tobacco Moths, Wasps, Waterbugs, Webbing Clothes Moths and Many Other Crawling Insects. Also Controls and Kills: Wood Infesting Pests – Termites (Subterranean, Formosan & Drywood), Carpenter Ants and Carpenter Bees. When wood injecting, expect to get up to 2" of coverage in both directions so that a hole can cover up to 4" of wood total (7/64th inch drill bit will make a hole just right for the injector straw). For termites and wood infesting beetles, drill 1/8" holes spaced no more than 4" apart. Inject using light pressure on the nozzle to avoid spray back. Fill holes and allow the treatment to soak in at least 30 minutes before retreating. Fill voids at least 3 times for maximum penetration and coverage. For wood more than 2" thick, consider using JECTA GEL. Safe For Use In (but not limited to): Food Handling Establishments, Including Food Service, Manufacturing and Processing Establishments, Such as Restaurants, Cafeterias, Supermarkets, Bakeries, Breweries, Dairies, Meat, Poultry & Egg Processing & Packaging Plants, Canneries, Feed Handling Establishments Including Feed Manufacturing and Processing Establishments, Tents, Aircraft, Apartments, Atriums, Attics, Automobiles, Basements, Bathrooms, Boats, Bottling facilities, Buses, Cabins, Campers, Candy Plants, Carports, Cat Sleeping Quarters, Clothes Storage, Condominiums, Decks, Dens, Driveways, Garages, Gazebos, Granaries & Grain Mills, Hospitals, Hotels, Industrial Buildings, Kitchens, Laboratories, Lanais, Living Rooms, Mausoleums, Offices, Parlors, Patios, Pet Sleeping Areas, Play Rooms, Porches, Railcars, Recreational Vehicles, Rooms, Schools, Ships & Vessels, Solariums, Storage Areas, Sun Rooms, Trailers, Trucks, Utility Rooms, Verandahs, Warehouses and Wineries. Killed the flour beetles. Quick shipping too. Product is easy to use with very minimal smell. Was effective in killing the confused flour beetles in our pantry. It worked! The little weavils are dead and gone! Hopefully the remnants of the spray in the cupboards does not infiltrate our food products? @Robert Troise: No need to be concerned safety wise. Assuming you did the application with everything removed and then allowed the treatment to dry before returning stored items, the chemical will stay where you put it. Also, when the right amount is applied, there won't be a significant residual that can impact stored items, just the bugs.